A very very unbirthday to me, to me! It was really nice that June could join us for 5 minutes towards the end of the tea, so we could pose for a lovely mad hatters photograph together :) perfect end to a perfect birthday tea! 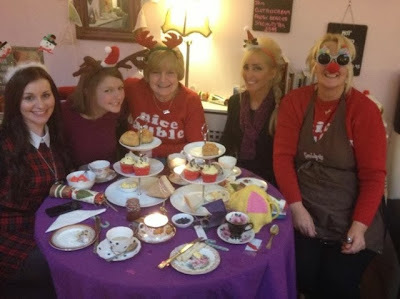 L-R: Natalie, Me, Mama L, Debbie and June-the crackers Christmas mad hatters! If you'd like to book an afternoon tea at Serendipity (situated in Frederick Street, Sunderland, Tyne and Wear) prices start at £15 per person. For more information call June and Robin on (0191) 5100054 or email info@serendipityteaandtrinkets.co.uk. Ho! Ho! Ho! To Winter Wonderland we go!